The Epson Workforce WF-5620DWF is a well known multifunction printer designed to challenge the small workgroup of laser printers. The printer weighs 14.2kg and measures 342 mm tall, 442 mm deep, and 461 mm wide. It saves time by using double-sided printing feature without connecting the printer to the PC. The printer generates prints at the speed of 20 ppm for colour and black & white documents. It is a 4-in-1 business inkjet printer that works exceptionally well in producing crisp, sharp and vibrant images, has low-power consumption, and fast printing speed. The printer has 35-page automatic document feeder and contains 330-sheet standard tray, 250-sheet secondary tray, 80-sheet multi-purpose tray to feed the paper easily. It boasts the printer compatibility with its built-in fax function, which makes it perfect for busy offices that are looking for an all-in-one printer with smooth paper handling functions. Epson uses Epson WorkForce WF-5620DWF ink cartridges with DURABrite Ultra Ink to produce fast printouts of exceptional print quality. It also supports printing through USB 2.0, Ethernet, Wireless LAN and a USB host port making it versatile to from anywhere. The Epson WorkForce Pro WF-5620DWF offers great benefit as uses the highest capacity Epson WorkForce WF-5620DWF ink cartridges and prints at a reasonable cost. It is well composed with the facility to print, copy, scan, and fax. However, it has no way to expand the paper capacity but, instead of that, it is a good choice for workgroups and growing businesses. How can I check the low ink cartridge status and maintenance box status of my printer? When one of your Epson Workforce WF-5620DWF Ink Cartridge is low, you will see the icon on the LCD screen and the orange status light will start flashing indicating the low ink status. Once a cartridge is expended, you will notice that the icon and the orange status light stay on continuously for a long time, till you replace the cartridges. You can use your status button to check the current status of cartridges and maintenance box. For more information, select the Epson Workforce WF-5620DWF Ink Cartridge images at the bottom of the screen. A low ink reminder appears on the screen if you’re trying to print when ink is low. You can check the cartridge or maintenance box status any time using a utility on your Windows computer. Replace or reinstall the maintenance box or the Epson Workforce WF-5620DWF Ink Cartridge if they are low. Disable the promotional offers by deselecting the display Epson offers checkbox. Q. Does the Epson Workforce WF-5620DWF printer meet the Energy Star guidelines? A. Yes, this printer meets the ENERGY STAR guidelines for energy efficiency. Q. What is the printing speed of the Epson Workforce WF-5620DWF printer? A. The Epson Workforce WF-5620DWF printer can print up to 34 monochrome and up to 30 colour pages per minute. Q. Does the Epson Workforce WF-5620DWF printer support fax? A. Yes, this printer supports fax as well as other functions like copying, scanning and printing. Q. Can I purchase these Epson Workforce WF-5620DWF Ink Cartridges in bulk or is there a risk involved of the cartridges drying up? A. Yes, you can purchase these items in bulk. To avoid the risk of the ink in cartridges drying up, make sure that they are stored correctly in a cool and dry place and are used before expiry date printed on them. Q. What will be the shipping cost if I order Epson Workforce WF-5620DWF Ink Cartridges from this site? Q. Do your compatible Epson Workforce WF-5620DWF Ink Cartridges come with warranty? A. Yes, all our products are FSC tested and certified and come with a warranty period. Q. Can you provide any guidelines on cleaning the Epson Workforce WF-5620DWF printer? First, you need to turn off the product. Then, you should Unplug the power cable. You should clean the scanner glass and the glass area on the left with a soft, lint-free cloth, moistened with a little glass cleaner. Do not spray glass cleaner directly on the glass and do not press the glass surface with any force. Open the Automatic Document Feeder cover and use a soft, dry, lint-free cloth to clean the rollers and the interior of the ADF. Clean the outer case and control panel with a soft, dry cloth. You must not use liquid or chemical cleaners. If lines appear on the printout or in scanned images, you need to carefully clean the scanner glass. Q. How do I use the duplex feature with my Epson Workforce WF-5620DWF printer on a Windows 7 PC? Access the printer settings by clicking on the printer icon displayed your computer's taskbar. Select the "2 sided printing" checkbox and choose appropriate duplex settings. Choose your prefered print settings like quality, paper size, orientation etc. Confirm your settings and click "OK" to start the printing process. Please note that duplex printing takes more time than 1 sided printing. Q. Will using compatible Epson Workforce WF-5620DWF ink cartridges invalidate my printer’s warranty? A. Absolutely not! Epson Workforce WF-5620DWF ink cartridges are manufactured to work smoothly with your printer without any hassle. Our compatible ink cartridges are of premium quality, that are FSC tested and certified. You do not need to worry about damaging your printer while using our compatible ink cartridges. Q. What is the monthly duty cycle of Epson Workforce WF-5620DWF printer. How many pages can it print in 1 minute? A. Epson Workforce WF-5620DWF printers have a heavy monthly duty cycle of about 35,000 pages. They can print up to 20 pages per minute for both colour as well as black and white prints. Q. 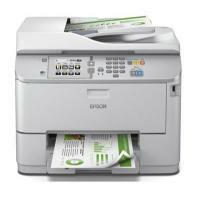 How do I print pages from my Android phone using the Wi-Fi network with my Epson Workforce WF-5620DWF printer? Make sure that your printer is connected to the same Wi-Fi network as your phone. Download the "Epson iPrint" app for your phone from Google Play. Launch the app and setup your phone with your Epson Workforce WF-5620DWF printer. You can now print or scan from your phone. Q. What is the ink volume of compatible Epson Workforce WF-5620DWF ink cartridges as compared to the originals? A. Compatible Epson T79 T7901 black ink has an ink volume of 42 ml and compatible Epson T79 T7902, T7903, T7904 colour ink cartridges have an ink volume of 19 ml as compared to original Epson Workforce WF-5620DWF ink cartridges, that have a ink volume of 41.8 ml for black ink and 17.1 ml for coloured ink. Q. Is this printer suitable for home purposes? A. Epson Workforce WF-5620DWF was mainly designed for office use, since it is a heavy duty printer with scanning, copying as well as faxing functionalities. This printer may satisfy your purposes at home but it quite big and bulky in size which may cause inconvenience to some users. Q. How much space does the Epson Workforce WF-5620DWF printer take up? A. Epson Workforce WF-5620DWF are quite big in size measuring about 461 mm in width, 442 mm in depth and 342 mm in height. They are also quite heavy, weighing about 14.2 kg. Q. Are Epson Workforce WF-5620DWF ink cartridges replaceable individually? A. Yes, Epson Workforce WF-5620DWF come with 4 separate ink cartridge slots. This enables the user to change only the ink cartridge which is finished, resulting in long term savings. You can find individual Epson Workforce WF-5620DWF ink cartridges of all colours on our website. Q. My Epson Workforce WF-5620DWF is taking too much time to print pages. How do I solve this? Make sure that the paper type selected in the print settings is the same as the paper that is loaded into the printer. You can try to choose a lower print quality, as the printer takes more time to print pages or high quality. If you have been printing continuously for a long duration, the print speed automatically reduces. This is done to prevent your printer from overheating and causing damage. It is recommended that you give the printer some idle time. This will enable the printer to print at normal speed. Q. What do I do if a faulty Epson Workforce WF-5620DWF Ink Cartridge is delivered to me? A. In the event that an item delivered to you is faulty, simply contact us on 048 308332211 or email us on info@printerinkcartridges.ie within 30 days of receiving your product. Just have your order details and invoice number and we will guide you through the process.